This is a marvelous time for the study of Chinese law at Michigan. 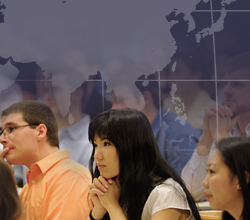 Michigan Law offers more opportunities to study Chinese law and legal institutions than any other law school in the United States and Canada. The Law School has worked hard to recruit Chinese-speaking J.D. students who now form a critical mass of law students at Michigan, creating an extremely hospitable and rich environment for those interested in Chinese law and legal institutions, and a place where our students can interact with top law scholars from China, Hong Kong, Taiwan and Singapore visiting Michigan Law each year. The Law Library and the University of Michigan's Asia Library combine to provide one of the most extensive multi-language collections of Chinese legal materials in North America or Europe, including a large collection of Chinese, Japanese and English language publications from the late Qing, Provisional Republican, and Kuomintang Government eras. Prof. Nicholas Howson with China People's University Vice President and Law School Dean Emeritus Wang Liming, Michigan Law Research Scholar '89-'90 (second from right). Asia Law Society Symposium 2009: Cook Global Professor Hwa-Jin Kim, Seoul National University; Nicholas Howson, Michigan Law; Don Clarke, George Washington University; and Chenggang Xu, University of Hong Kong. Sharon Hom, executive director, Human Rights in China, spoke on "U.S.-China Relations and International Human Rights" during a 2009 visit to the Law School. Professor Jerome A. Cohen, NYU School of Law, presents "Does China Have a Legal System?" Professor Tang Xin, Tsinghua University School of Law, presents "New Progress of Corporate Governance in China." James Kynge, former Financial Times Beijing Bureau Chief and author of China Shakes the World. Wang Dan, leader of the 1989 Student Democracy Movement in China, presented "Realizing a New China" during a 2007 visit to the Law School. Ambassador Charlene Barshefsky, former U.S. Trade Representative (1997-2001), addresses the February 2011 Michigan Law School/Wayne State Law School U.S.-China Economic Law Conference. Scott Kennedy, Indiana University; Merit Janow, former WTO Appellate Body member; Tim Stratford, former Assistant U.S. Trade Representative; and Li Yongjie (standing), PRC Ministry of Commerce, at the 2011 U.S.-China Economic Law Conference. Zhao Minyuan, U-M; Mary Gallagher, Michigan Center for Chinese Studies; Nicholas Howson, U-M; Zheng Wentong, Buffalo Law School; and John Ohnesorge, University of Wisconsin (Madison) Law School, at the 2011 U.S.-China Economic Law Conference. Zhao Minyuan, U-M Ross School of Business, presents at the February 2011 Michigan Law/Wayne State Law School U.S.-China Economic Law Conference. Sungjoon Cho, Chicago Kent College of Law; Zhang Ruosi, WTO Trade in Services Division; Mark Wu, Harvard Law; and John Ohnesorge, University of Wisconsin (Madison) Law School at the 2011 U.S.-China Economic Law Conference. Alan V. Deardorff, John W. Sweetland Professor of International Economics and professor of economics and public policy, U-M, at the February 2011 Michigan Law/Wayne State Law School U.S.-China Economic Law Conference. Michigan Law Prof. Nicholas Howson delivers his paper "Between a Rock and a Soft Place?—The China Audit Papers Enforcement Problem" at a conference on corporate and securities law held in December 2014 in Hong Kong. Alexa Lam, former deputy CEO of the Hong Kong Securities and Futures Commission, at the inaugural Lieberthal Rogel Center for Chinese Studies at the U-M Distinguished Visitor Lecture.